Today’s World Environment Day 2018 begins a year focussing on plastic pollution. The theme, as is custom, was chosen by the host country. This year India is hosting the annual event and leading from the front with their efforts to bring an end to plastic pollution. Why is it crucial that plastic pollution is addressed? Plastic pollution is a hot topic across the world at the moment, in particular reducing the amount of single-use plastics we are using. Why is single-use plastic such a big deal globally? On a worldwide basis, nearly one-third of the plastic packaging thrown away does get captured by a collection system. Most of the developing world lacks any form of waste collection system. As a result, every year, up to 13 million tons of plastic end up in the ocean, threatening millions of marine animals. To save the world’s oceans from becoming completely swamped by plastic, nations with advanced collection systems, such as the UK, need to help third world nations, where the main problem is, to build effective recycling collection systems. This way, we can take a big step towards ending plastic pollution globally. World Environment Day seeks to influence changes in 4 main areas. Single-use plastics such as plastic bottles, plastic bags, and plastic food packaging are the biggest challenge in the battle against plastic pollution. After use, in parts of the world with no collection systems, these materials are discarded and where not disposed of correctly, contributing to plastic pollution. Since the UK has suitable collection systems, we do not contribute significantly to the plastic waste in the oceans. Waste management systems have developed rapidly in first world economies but World Environment Day highlights the need to improve or introduce systems in emerging economies to ensure as little plastic as possible is making it into the ocean. Here in the UK, you should be looking for a new waste collector that can handle multiple recycling streams for you. To help get the right partner, you can take a look at our guide, covering 8 questions to ask any new potential waste operator. Microplastics are a result of plastic waste being broken down into tiny bits after years in the ocean. There are also microbeads which are tiny plastic particles often seen in beauty and skin care products (now banned in the UK). When microplastics make it into the ocean, aquatic life and birds can mistake these particles for food and, when eaten, it can be life-threatening. There is also a danger here from those plastics entering our food chain. An example would be when ocean-dwelling fish is presented on our dinner plates. An equal danger is created by plastics in oceans leaking chemicals like plasticisers into the water, again accumulating in the food chain. Research shows that there are numerous alternative solutions to oil-based plastics, but these are not rapidly replacing our current materials. However, with further research, sustainable alternatives could become more widely available. What can you do this year to support the World Environment Day initiative? Ending plastic pollution is something that needs to be tackled by individuals, businesses, governments and organisations worldwide. Those parts of the world making advances in plastic recycling need to share technologies and approaches with economies without any such systems in place. Register an event to highlight the issues. Take matters into your own hands and register to run your own event to tackle plastic pollution. Download a toolkit to help plan an event. Review ways to cut down on single-use plastics and find sustainable alternatives that will reduce plastic pollution. When you have done everything you can to ensure you are reducing the amount of plastic you are using, you then need to work with your waste operator to present plastic waste in the best way possible for collection. At Westminster City Council Commercial Waste Services, all of the recycling that we collect gets sent to the relevant sorting facility to ensure it is recycled to the highest standard. As an example, the automated machines in Veolia’s material recovery facility use infrared technology, magnets and electric currents and star screens, to ensure the waste is separated out. 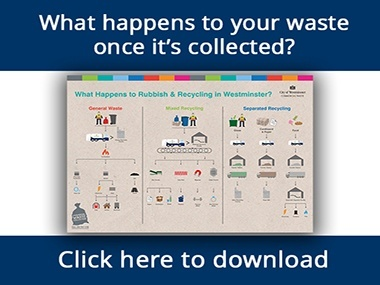 To get a full picture of where all of the waste that we collect ends up, you can download our ‘where your waste goes’ Infographic.